Gold and pyrite are vastly different minerals, but because of their similar colors they easily confused. Beginning prospectors look in the bottom of their gold pan and see a lot of shiny yellow color and think they have hit the mother lode! 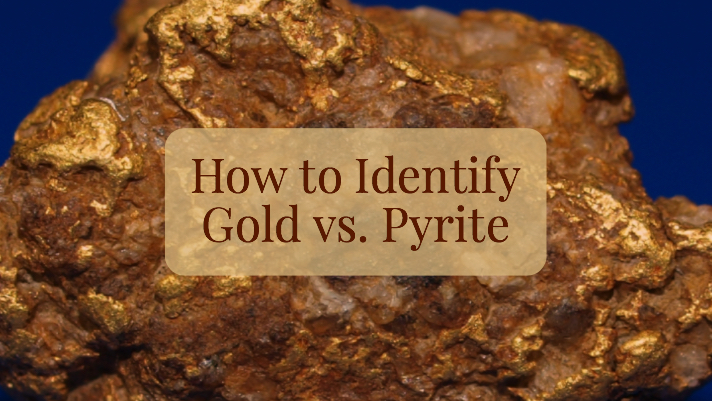 Learning how to identify both gold and pyrite is one of the first skills that any gold prospector should learn. The structure, color, hardness and specific gravities are all indicators that will help to differential between the two. The most obvious way to tell the difference between them is the specific gravity. When panning out material, gold will settle and concentrate in the bottom of the pan, but pyrite will move freely in the pan. You will often see them at the surface mixed in with the lighter sands and gravels. Proper gold panning will easily separate the two, as the small specks of pyrite will wash out of the pan while the denser gold particles will be retained. The color is also a good indicator between the two. While gold obviously has a golden color, pyrite generally has a brassy and shiny coloration. It has shiny surfaces that catch the reflection of the sun. If you move your gold pan in a circular motion in the sunlight, gold will maintain a consistent color, while pyrite will flash in the sunlight. If you take a pocket knife and separate the particles out, their different hardness will be readily apparent. Pyrite is much harder, so if you smash it with the tip of your pocket knife it will shatter into several pieces. Gold on the other hand is a very soft and malleable metal. It can be smashed flat without breaking apart. The structure of each mineral is quite different, although this can be difficult to see if you are only dealing with small flakes at the bottom of your gold pan . If the pieces are large enough, you will notice that most pyrite is generally structured in cubic, octahedron and pyritohedron formations. Although there are crystalline gold specimens that sometimes share these rare formations, they would be considered the exception rather than the rule. Most gold nuggets and flakes that are found in rivers and creeks are polished and worn fairly smooth. The differences between gold and pyrite are fairly obvious, and a little experimentation will clearly show you what you are dealing with. The easiest indicator that most experience gold prospectors use is simply evaluating the characteristics of how they react when swirled around in a gold pan. If they will easily move and remain on the surface of the material in your pan, you are likely dealing with iron pyrite. If you can see it shining in the bottom of a creek, on the top of all the sands and gravels, you have most likely got pyrite. The truth is that once you have figured out the difference it is rather easy to tell the difference between them. Most experienced miners don’t even give it a second thought. Once you have seen real gold, you will never confuse it with anything else.